Paarl Heights Rose South Africa wines 6 bottle case. 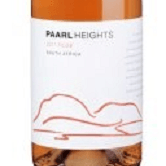 Paarl Heights Rose - This medium-bodied dry rose from South Africa wine has a beautiful cherry pink colour with aromas and flavours of crushed redcurrants and strawberries. Crisp and refreshing. A cherry pink wine with aromas and flavours of crushed redcurrants and strawberries. the fruit is harvested by hand yielding 6-8t/ha.